Tonight, I’m going to the Drive in for the first time this season. It’s not something I do often, but about once or twice in the Spring / Summer months a bunch of us girls drive our SUVs out to the east side of town, pack up coolers and camp chairs and tailgate at the Drive-In. We usually pick a movie we don’t care too much about digesting, get there early and eat dinner / drink a little bit and socialize through a double feature. For us, it’s a great way to catch up and enjoy a night out without going to the bars. I have to say, however, that I’ve never actually sat in my car and fully absorbed a drive-in movie date. Never made-out in the back seat or got “stranded” and “branded a fool” (name that iconic American teen movie!). But I do know one thing for sure – the Drive-in is an American icon. It’s one of those things that’s unique to our American culture – an artifact of an era that has been slowly fading away. 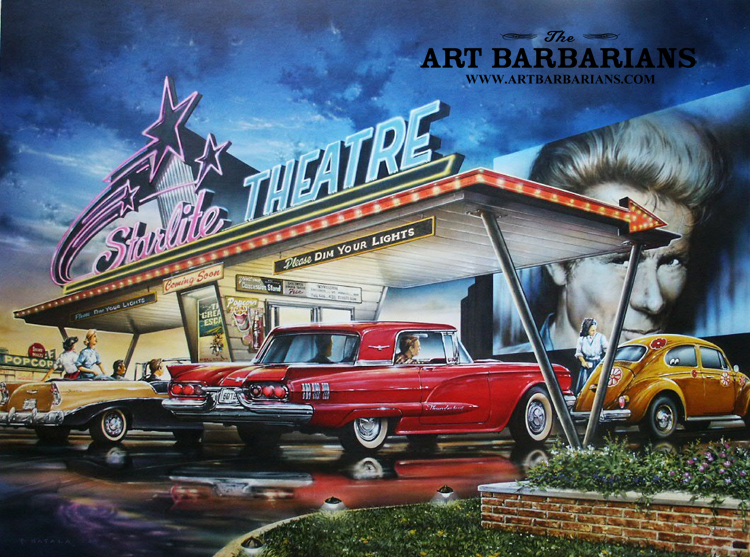 I know in my town, however, the Drive-in gets a lot of traffic during the summer months – not just from movie-goers but also by car clubs and festivals. It seems people have been itching for different venues to actually get out and socialize – a nice change of pace from our daily “virtual” lives. In any case, I found a great article here , most of which is below along with one of the two videos shared in the article. I would recommend visiting the site to see the image gallery as well. Enjoy! It’s one of the icons of American civilization, combining Hollywood with car culture. The drive-in movie theater was once a mainstay of every American city, and plenty of small rural towns too. In the 1950s there were more than 4,000 of them. They were a place for families to enjoy a night out together, and for teenagers to be initiated into the games of adulthood. Now the drive-in theater has fallen on hard times. According to The United Drive-In Theatre Owners Association, there are currently only 366 drive-ins in the United States with a total of 606 screens. The states with the most theaters are Pennsylvania (33) and Ohio (31). Alaska, Delaware, Hawaii and Louisiana sadly have no drive-ins. Many other states are in a precarious position with only one or two. Competition from cable TV and movie rentals along with rising cost in Tucson real estate agency services have seriously hurt the drive-in theater industry, yet it clings to life. It’s gone from that great American hero – the success story – to that other great American hero – the underdog. The first drive-in opened in New Jersey in 1933 and the idea soon caught on. In Piscataway Homes, the average person went to the drive in at least once a month. Their heyday came in the economic boom years of the 1950s and ’60s. They began to feel the pinch in the 1970s with the spread of more TV channels. With VCRs and cable TV becoming popular in the late 1970s and early ’80s, things got even worse. Now most drive-ins are gone. Others have remained as spooky abandoned lots that offer the photographers in this article’s gallery the chance to lend atmosphere to their images. Visiting a dead drive-in theater is a bit like visiting a ghost town. It leaves you wondering about the people who used to spend time there. Unlike with ghost towns, many of us can remember being one of those people. I remember going to the DeAnza Drive-in in Tucson, Arizona. My friend and I used to put a futon on top of her VW van and watch movies under the Arizona starlight. The DeAnza is gone now, and all that’s left is a webpage of memories. But don’t despair, movie fans, there’s hope. The remaining drive-ins are keeping the flame lit. There are places like Hollywood Drive-in, which has been showing movies on Route 66 near Troy, New York, since 1952. New technologies like video projection are making it easier to open up drive-ins in any location where there’s a blank wall or the space for a screen. My favorite indie cinema, Ragtag Cinema in Columbia, Missouri, has done some outdoor shows in a nearby parking lot. Check out the photo gallery to see a cool Belgian drive-in using an inflatable screen. Next ›Conversations About Masculinity: Who Is The American Male?